An article today in The CT Mirror explores the importance of the consumer voice when it comes to health insurance rates. 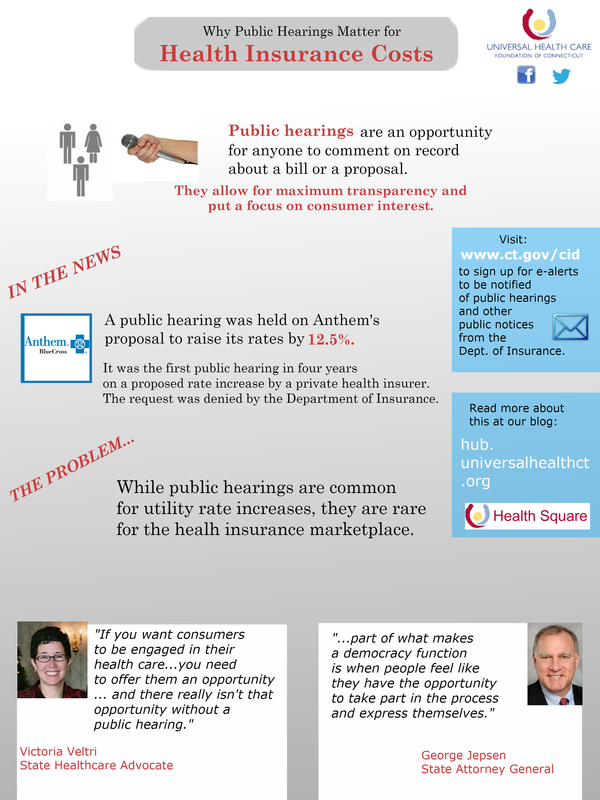 The article is titled “Do public hearings influence what health insurance costs?” We here at Universal Health Care Foundation of Connecticut (UHCF) believe that they do and that we need to continue to advocate for public hearings any time a significant health insurance rate increase is proposed. Higher insurance rates have a direct impact on consumers—their concerns should be heard. While the aforementioned are the only factors considered when deciding to approve or reject insurance rate changes, it is critical that consumers be allowed the opportunity to advocate on their own behalf. Unfortunately, as the decision points out, service delivery failures or affordability are not considered in the department’s decision. But to only consider the opinions of professionals (providers, insurers, actuaries, etc.) devalues the important role consumers are entitled to play as stakeholders in their own health care. In municipalities, Planning and Zoning Boards, Boards of Education and others are typically made up of everyday people who’ve been either elected or appointed to those positions of leadership and decision-making. When telecommunications companies want to install cell phone towers or if a public utility sets out to increase its rates, public hearings are held before decisions are made. Health care should be no different—in some way, shape, or form the voice of the persons directly impacted by policies regarding health care, such as insurance rate hikes, must be heard and considered.